Today was Bennett’s last day hiking and we did a little bit of everything–some rain, some sun, some roads, some paths, a lot of up and down, towns and forests, boat and funicular. 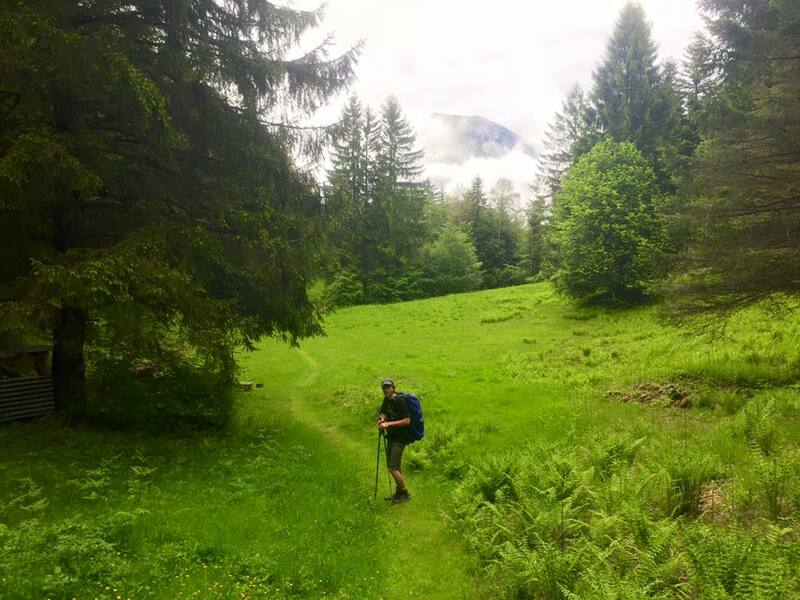 The walk out of Emmetten was initially on the Swiss Camino as we crossed a ridge to get back on the Trans-Swiss. In many ways that part was the best hike we’ve had the entire trip as it went through an old, managed forest with many paths, but also great stands of trees, mostly beech, shaggy with moss which flowed down onto the rocks. The road thinned to a rocky path–the kind that makes you happy to be walking. Late morning we found ourselves descending to a village on a cliff looking over Lake d’Uri, then following the ridge line finally descending to water level at Bauen. There we stopped for an early afternoon pint on a deck overlooking the lake, basking in the sun until it turned into an intense shower. We withdrew to an awning and watched as the ferry boat came it. Moment of decision–walk the last 5 km on a level and not particularly interesting road in a heavy downpour, or run and catch the boat. Good sense prevailed over a misplaced need to walk every foot of this trail. The bartender capped our bottles, requesting we leave them with the woman who runs the kiosk by the landing, and soon we were climbing the gangplank on our way to Fluelen, the town next to our destination. Arrival brought some confusion– I had booked a cheap room in a lodge in Altdorf, but the address just brought us to a gondola lift station. We then learned that the cheap room in Altdorf was actually on top of the mountain in Eggberge, and our transport was via cable gondola. The steep ride up first afforded views of our afternoon journey, but with altitude we could soon see back over most of the day’s walk. The clouds cleared a little and the views were as you would imagine. Tomorrow Bennett catches the train to Zurich and the plane to Atlanta while I resume solitary hiking probably to the end of the Trans-Swiss, which is either in Lugano or Chiasso, depending on which guide you read. It has been a good two week trek, renewing our dual hiking rhythm honed over three summers of the Appalachian Trail and the last bit of the Pacific Crest. Just like when I saw Charlie in Tanzania, it’s been remarkable to reconnect with a son after my long absence. In many ways, we picked up just where we had left off, but at the same time, we’ve both gained different perspectives over the last nine months and exploring those shifts was enlightening. I know tomorrow I’ll feel that emptiness, returning to the solitude that has characterized most of this year-long walkabout, but I’ll also have memories of all the talk, the walk, the laughs we had together.